Editor’s Note: The EIA’s latest data release indicates that U.S. exports of finished gasoline averaged 605 kbpd during the January-November period of 2016. This is a 27% increase over year 2015 exports of 476 kbpd. The Mexican government is in the process of opening its gasoline and diesel markets to outside competition and replacing government-set prices with market-based prices. Last year, Mexico began allowing entities other than the state-owned company Petróleos Mexicanos (Pemex) to import gasoline and diesel and open retail stations. These changes followed previous energy sector reforms that ended Pemex’s upstream monopoly and opened the oil and natural gas sectors to foreign direct investment. Although Mexico is a large crude oil producer, it relies heavily on imports of gasoline from the United States to meet domestic demand. Therefore, the outcome of gasoline market reforms in Mexico may have significant implications for the sale of U.S.-produced gasoline. The switch to market-based pricing is being implemented in phases starting with a series of national price adjustments. The transition began at the start of this year. As a result, January retail prices have averaged 14% and 20% higher than in December for regular gasoline and premium gasoline, respectively. Several other national adjustments will be made in the coming weeks. Full market-based pricing will be rolled out regionally beginning with the northern states of Baja California and Sonora on March 30. For the past several years, Pemex total gasoline sales, which can be used as an estimate for consumption, averaged around 800,000 barrels per day (b/d). However, gasoline sales increased 2.5% and averaged nearly 820,000 b/d in 2016 (through November). Mexican consumption of gasoline has been significantly greater than refinery production, with the difference increasing over the past three years (Figure 1). 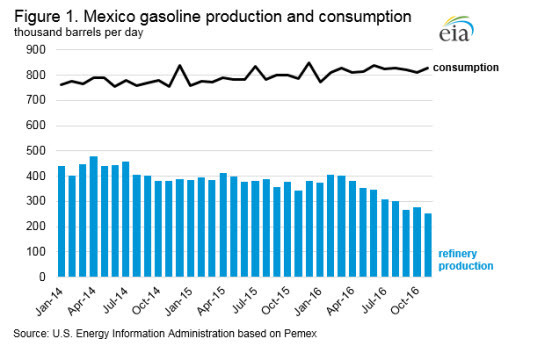 Mexico’s refineries have historically been running at low utilization rates because they are challenged to produce clean gasoline and distillate fuels from the available marginal barrel of heavy sour crude oil. More recently, outages have hampered Mexico’s six refineries, which had a total output (including non-gasoline products) of 1.1 million b/d through November 2016, down from 1.3 million b/d over the same months in 2015. Mexican refinery output of gasoline fell steeply to 381,000 b/d in 2015 and then fell again to 333,000 b/d in 2016 (through November). Refinery utilization rates in Mexico declined in 2016 from 78% in January to 60% in November, creating a widening gap between domestic supply and demand. 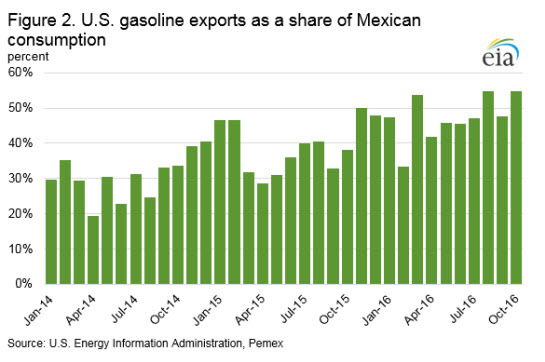 To meet demand, Mexican imports of gasoline have climbed rapidly over the past two years. According to Pemex, Mexico’s motor gasoline imports were 122,000 b/d higher during the first 11 months of 2016 than during the comparable 2014 period. Since 2008, EIA data indicates that Mexico has imported significant quantities of U.S. gasoline. Based on U.S. and Mexican data sets, U.S. gasoline exports accounted for 80% of all Mexican gasoline imports and provided an average of 47% of Mexico’s gasoline consumption during the first 10 months of 2016 (Figure 2). The volume of gasoline trade between Mexico and the United States is significant to U.S. refineries. Over the past five years, U.S. exports to Mexico accounted for between 44% (2014) and 54% (first 10 months of 2016) of total U.S. gasoline exports. On a year-over-year basis, U.S. gasoline exports to Mexico increased by 71,000 b/d in 2015, with additional average growth of 75,000 b/d over the first 10 months of 2016, when U.S. exports to Mexico averaged nearly 390,000 b/d. While the effects of the ambitious reforms now underway in Mexico’s energy sector will only be realized over an extended period of time, their possible impact on both gasoline demand in Mexico and the amount of gasoline produced in its refineries could have significant implications for the future trends in U.S. gasoline exports to that key market. Regardless, Mexico will remain a major destination for U.S. exports. This article is part of GasolineTagged export, gasoline, Mexican, trends, U.S.